To compliment the natural surroundings, EcoStruction’s challenge was to add 300 sq. ft. of matching flagstone and create 1650 sq. ft. of new decking. Using recycled plastic lumber (RPL) instead of conventional lumber, ECO-STRUCTION installed new decking that continued the color flow of the existing flagstone. 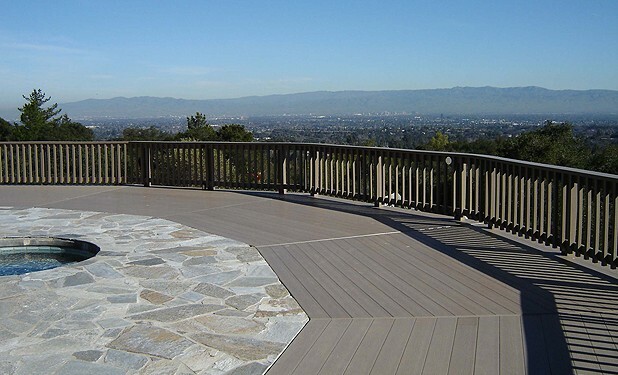 The resulting deck outlasts all chemically treated woods, resists termites, does not rot, splinter or decompose. It never needs painting or sealing and does not degrade when submersed in water. RPL is manufactured from high-density polyethylene (HDPE), a raw material derived from 100% recycled bottle waste, 25 bottles per square foot, cleaned to a purity level of 99% or above. Recycled Plastic Lumber (RPL) requires care in installation, since the long runs are not uniformly straight and, therefore, must be worked into proper form. Because expansion coefficients are high with this product, the placement, temperature and location of expansion joints are critical. The final result is easy to care for and uniform in color. The (RPL) product used comes with a 50 year manufacturer’s limited warranty.